New year - more writing! I have decided that this year I would like to write more about everything going on in my life, so let´s see if I manage to keep it up. I would like to remind everyone that these are my own personal words and opinions. As most of you know I have been working as a reporter for the World Rally Championship (WRC) for a while now. At my very first rally as part of the WRC TV team (Monte Carlo 2016) I was put on stage-end duty for the linear TV Live stages and that is something I have been doing at every rally since. I would say my approach to this job is to try and keep it simple for the drivers but also bring in key points like times, damage to the car, what´s at stake etc. 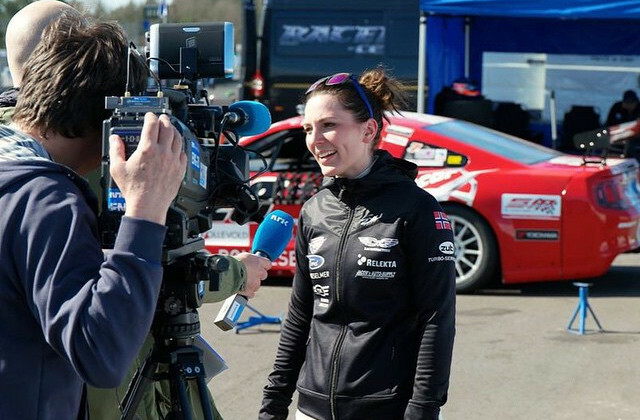 Many of the drivers have English as a second language and with a roaring engine, adrenaline through the roof and eager to crack on you don´t want to have to ask the reporter to repeat themselves either. It´s also important for me to be 110% sharp - because I will get sharp comments from the drivers ( Ott Tanak? ;) ) hehe... It is quite special that we are able to speak to every driver after every stage so I will put up with some cheek every once in a while. Many people ask me if it bothers me when they give a one word answer, or if they make me look stupid or even if they just drive off without saying anything. Absolutely NOT! The more of their character that they bring out, the better. I want those spontaneous, emotional and straight answers. Because communication can be challenging at most stage-ends I need to rely on my own maths, what I see visually on the car and the body language of the drivers. 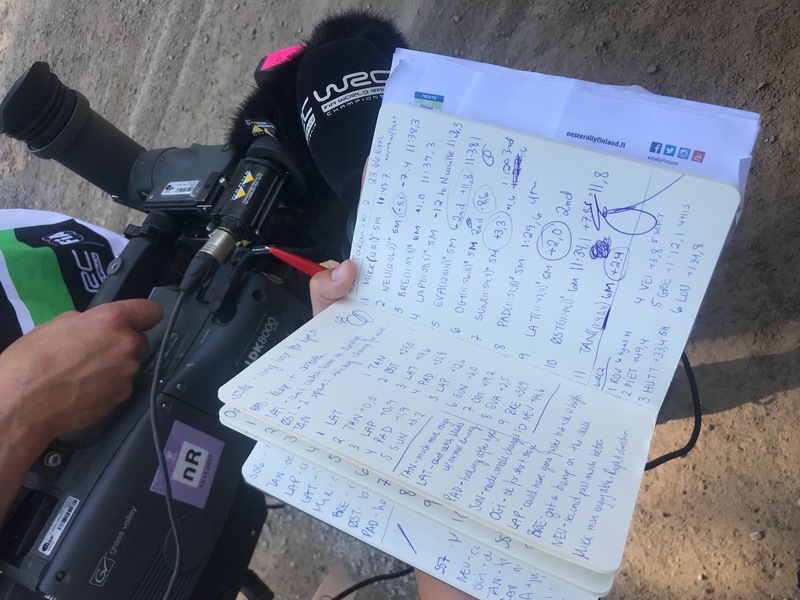 Here is a picture of what my notebook typically looks like for a stage of the World Rally Championship. 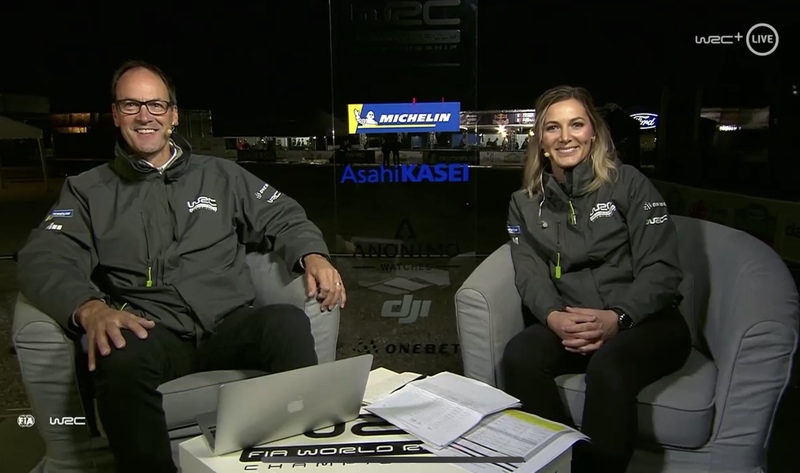 In 2018 everything changed for us in WRC TV when we started with "All Live" meaning we would broadcast every stage, media zone, services, etc LIVE. I was shifted around quite a bit, sitting a long side the host in the studio and then in Wales 2018 I hosted the studio myself on Friday morning. This was a lot more fun that I thought and it felt relaxed and comfortable. And it´s good that we can all be flexible and do each others jobs. My role in 2019 will be similar to 2018 where I will be covering services live, media zones and stage ends. So many changes in 2019 and I cannot wait to get started with Rallye Monte Carlo next week! What a shock that Seb Loeb signed with Hyundai to do 6 rallies! And Kris Meeke being back is fantastic news. He has been given another chance and the WRC is better with him in it! Just today I find out that Marcus Grönholm will be joining us for Rally Sweden in a Toyota Yaris WRC. I mean Loeb and Grönholm back again fighting in out in WRC cars? Epic stuff! I wonder if Loeb is thinking of road position in Sweden or if he just wants to win Rallye Monte Carlo no matter what. I am sure it´s the latter. He has done enough road sweeping in his career so I´m sure he is not bothered. I think the 2019 cars are looking good and I have to agree with those saying that the Hyundai & Citroen drivers look a bit like comic superheroes. If you ask me my prediction for 2019 World title I would say yet again that there are so many drivers who could get it. Ott Tanak was so strong in 2018. Had he not been so unfortunate in Wales and Spain and retired out of the lead in both rallies he most likely would have become World Champion. He was near unbeatable in the second half of the season. He had 70 stage wins(!! ), the next on that list is Neuville with 40. Watch out for Ott this year! Seb Ogier wants a 7th title, no doubt about that. And of course to match Juhu Kankkunen taking World titles with 3 different manufacturers. Seb is now with Citroen in a car we have seen develop into a rally car that is fast on all surfaces. Add a touch of Seb to that and it might just be lucky #7. Jari-Matti Latvala had such a strong finish to 2018. There was a change to him and he seemed more relaxed, spoke his mind and just trusted his own abilities. This rewarded him with several podiums. Going into his 13th WRC season this year he wants that title perhaps more than anyone else. Thierry Neuville has finished runner-up many times in the WRC. He led the Championship for a long time last year and it must be bitter sweet to have been so close at the last round in Australia. He definitely gave it everything there! A lot of changes now a Hyundai, so it will be interesting to see if this also reflects on their results. Especially interested to see what Loeb will bring to the team. The pressure is on! Many more contenders of course but I think it will be a fierce battle between the 4 I have mentioned above. At the end of January I will be the MC (together my colleague from WRC - Emyr Penlan) for the FIA Rally Hall of Fame in Paris. 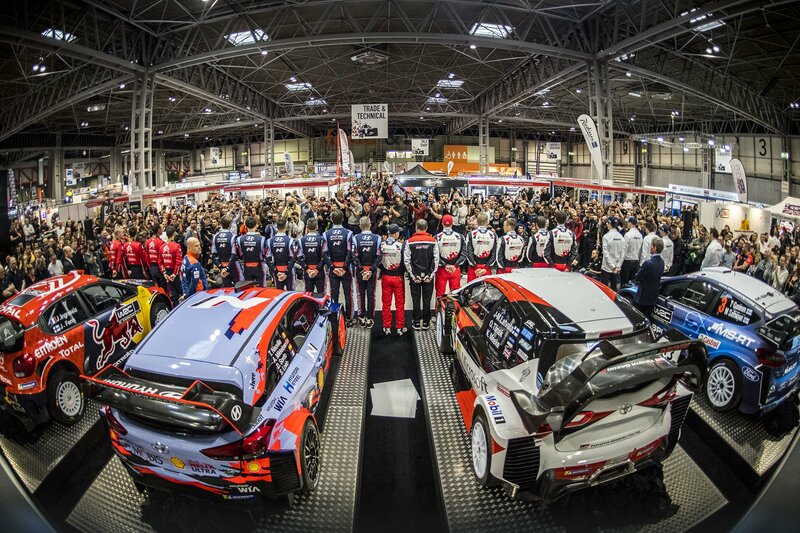 An event to honour all of the FIA World Rally Champions. I have been taking a proper trip down memory lane lately and I can´t wait to spend this day with these great legends of the past. Nytt samarbeid med Kollevold AS og OMP!